Easily synchronize all of your contacts across all of your computers, PDA's, and cell phones. This uses the CBASE-1 standard format. This can run on its own, or it can also integrate with Build In The Black so that all workers have all of the suppliers, employees, and customer contacts on all cell phones, and updates done out in the field can update the records back in the office. $2.00 for unlimited contacts on Android tablets and phones. Click here to download for Android 1.5 and 1.6 devices. Click here to download for Android 2.0, 2.1, 2.2, 2.3, 3.x, 4.x and higher devices. Click here to learn more about the CBASE-1 format. For any field work, this handy application allows you to manage jobs and their job tasks out at the site. This can run on its own, or it can also integrate with Build In The Black so that site supervisors can easily update the Gantt Charts back in the office. $3.00 for Android tablets and phones. Coming soon! This app allows you to practice typing into your Android tablet or phone. It times you while you type in the sentence: the quick brown fox jumps over the lazy dog. It stores your best times, so that you can monitor your progress and see improvements in your accuracy and speed. Also, you can use this app to quickly test the on-screen keyboard, or physical keyboard, on any Android device. The sentence has all of the letters in the English alphabet. When you concentrate on entering it in accurately, you are training yourself to become better at typing on the device. This app can also be used to detect the device's responsiveness. Are you trying out a new Android tablet or smartphone? 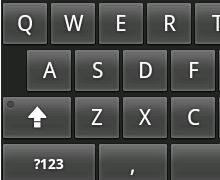 Are you curious how well you would be able to use the keyboard? Here's your chance to compare the new one in the store to your existing one. Install this free app, key in the sentence a few times on your existing device. This gives you a baseline to measure against. Then, when you are out shopping around, you can try an Android tablet or phone, quickly install this app, and test it in the store. See how your best time with the new device compares with your best time on your own device. Test another Android device with this app to see how you like it. This app is tiny. It downloads and installs very quickly. It's very easy to use. Oh, and by the way, there's an "easter egg" hidden somewhere in this app. Can you find it? Free for all Android tablets and phones. Click here to download AS Typing Practice onto your Android tablet or phone. If you want to lose some weight, try using this app. When you follow the advice from the built in certified Life Coach, you will discover the secret. This is a mobile app that is your personal supporter. Mobile devices are always on you or close by, so this is a fun and friendly companion, with a purpose to help you lose weight. Click to learn more about the Happy Hungry mobile app. Where R U is a mobile app that lets you know where friends and family are, without using GPS. You can also set your status of what your're up to. And, you see where they are and what they are up to. How often do you send the text message, "Where are you?" By using this app, you will know where your family and friends are at a glance. This will give you peace of mind. It's a social networking app, but with the benefit of privacy! This app does not use Facebook or any other list of friends. This full version costs $3. The there is a free trial version, available only on Android right now. The trial lets you install and use it free for 90 days! Where R U mobile app. Click here to learn more.